Staying cool in the hot summer months can be a challenge for people of all ages; but it is especially important for seniors. As we age, our bodies lose the ability to perspire and to properly regulate body temperature. Through this process the skin begins to thin and offers less protection from heat. 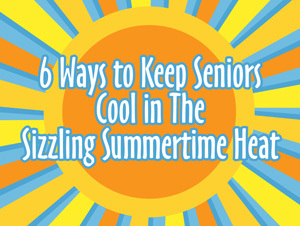 The sun’s rays also make seniors increasingly susceptible to emergencies including heat exhaustion and stroke. According to the CDC, 40% of the 3,401 heat related deaths in the United States between 1999-2003 were seniors ages 65 or over. You can help prevent heat related illnesses by keeping your loved ones safe and cool by following these 6 tips for dealing with hot weather. Avoid caffeinated and alcoholic beverages which can lead to dehydration. Seniors should keep a bottle of water with them and refill often to ensure they keep hydrated. Limit exercise to the cooler hours of the day – either morning or evening to reduce raising the body temperature during the hottest part of the day. Don’t use the oven or stove which will add heat to the home. Instead opt for lighter precooked meals that include salads and or other foods that don’t require heating. Close window shades or add a reflective board to the outside of the windows to darken rooms and reflect the sun’s rays. Avoid being outside during 11am-3pm which is generally the hottest part of the day. If your loved one insists on being outside, make sure they have an available shelter under an awning or umbrella. Sunblock should always be used on exposed skin even if only for a short period of time. A wide brimmed hat is also a great way to help keep the sun off the head and neck. If your loved one lives alone, be sure to check in on them several times a day. If you are not able to, ask a neighbor or a friend to check in on them. If you are unable to check on or keep a watchful eye on your elderly loved one, consider hiring a Caregiver from Assisted Healthcare Services at (800) 949-6555 or www.assisted1.com. Our trusted caregivers can help keep your loved one safe, cool and out of harm’s way during the sizzling summertime heat. This article was posted in Caregivers, Elder Care and tagged Healthcare Advice, Senior Care.